A Vietnamese student is seen in this still image taken from the SBS Radio footage. An exclusive investigation led by SBS Radio’s Vietnamese program has uncovered exploitation and underpayment of migrant workers in Vietnamese restaurants in Melbourne, with international Vietnamese students sharing their experiences of being expected to work excessive hours for hourly rates as low as six dollars. After a social media post from a Vietnamese student sharing their experience working at a Melbourne-based restaurant attracted hundreds of comments from others in the community claiming to have had similar experiences, SBS Radio commissioned an investigation to explore the allegations further. 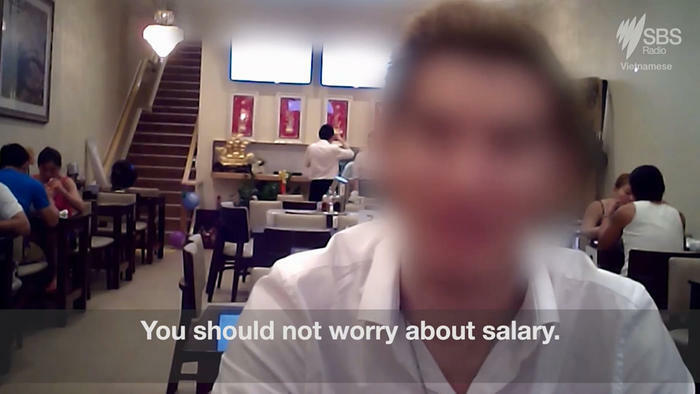 As part of the investigation, an undercover job seeker sought work at more than 20 Vietnamese restaurants across South East and West Melbourne, with the footage of her experience revealing that most of these restaurant owners refused to discuss wages upon employment of staff, with none offering more than ten dollars per hour, paid only in cash. One staff member advised SBS Radio’s undercover job seeker that she shouldn’t question wages if she wanted to remain employed. Further conversations with students, conducted as part of investigation, reveal that some restaurateurs maintain two financial diaries, with forged data on the number of employees being supplied for ATO purposes. Students also advised that Vietnamese migrants are preferred employees for easier communication, and that due to the language barrier and limited grasp of English; international students are willing to accept any job conditions and salaries to survive in Australia. Four years after working in a Vietnamese restaurant, Helen Nguyen, who has now completed her studies and is currently working as a nurse in Sydney, recalls the mistreatment she experienced, telling SBS Radio: "They [my employer] said I was too young and they felt…sympathy for me. So they hired me, paid me $35 per day for training period. I was so happy; I did not know the minimum wages in Australia was about $16, $17 [per hour]. “They promised if I work hard for them during a long time, they will pay me more. But I was very shock for the first day at work. I had to clean everything, do kitchen hand, and do waitress jobs. At that time, I recognized my owner was playing a trick on me,” she added. When contacted by SBS Radio, the Fair Work Ombudsman indicated that they are aware that small businesses are exploiting their labour and consider this extremely serious. A spokesperson said: "The Agency is focused on ensuring more is done to ensure culturally and linguistically diverse business operators understand and comply with Australian workplace laws. We understand that there are cultural challenges and vastly different laws in other parts of the world, but want to increase awareness that it is essential that all businesses operating in Australia understand and apply Australian laws." Speaking in defence of small businesses in Melbourne, the President of Footscray Asian Business Association, Wing La, says that it is not fair to blame the underpaid issue on restaurant businesses, and that exploitation is not only occurring within the Vietnamese community. He said: “This has happened because of the two parties. If students decisively refuse underpayment, then this [issue] wouldn’t exist. To some extent, this is also the students’ fault. It is not easy to solve. One side is willing to be exploited; other side is ready to take offense. It is not only happening in Vietnamese communities, but also other communities”.